A Modern tent style slightly masculine card (although also perfect for the woman who is less keen on the cute and fluffy.) Beginning with a red textured base card it is then decorated with the central feature of 3 ink embossed (onto water colour paper for more texture) hearts mounted on a black card strip. The left lower corner of this strip is further decorated with 3 tiny black gems and the opposite diagonal corner with 3 tiny red gems. 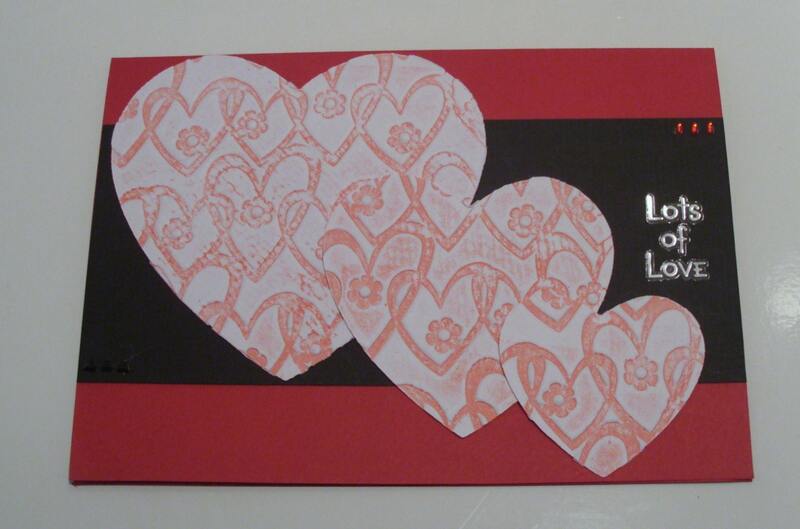 The card is then finished with "Lots of Love" greeting. A simple stylish way to send your valentine greeting.